Nick Wilson was once the most powerful superhero on Earth. In fact, he was the ONLY superhero on Earth. Fresh out of high-school, Nick somehow acquired the full complement of super powers. Flying. Super Strength. Bullet-Proof Skin? The works! Though he donned the traditional cape and tights, Nick never bothered with a secret identity, a mask or a code name. He was always Nick Wilson and Nick Wilson became rich, famous and had his pick of all the beautiful women he wanted. Then Nick lost his powers, as mysteriously as he gained them, The fame and fortune dried up. The women vanished. Now Nick is stuck eking out a living appearing at children’s birthday parties while pretending to be a Nick Wilson impersonator. It’s not much but it pays the bills on his one room apartment and his medical marijuana prescription. Or it would if Nick didn’t give away so many free appearances to needy kids. Despite everything in his life going south and having become a national joke whose bad luck is tabloid fodder, Nick is still a hero at heart. But with his 30th birthday approaching, Nick is searching his life for meaning and a new direction even before he gets a phone call from his high-school sweetheart. And unbeknownst to Nick, there’s someone else from his past who wants to see him again too… Deconstructions of the superhero genre are nothing new, whether they are played straight (as in Watchmen or The Dark Knight Returns) or played for laughs. 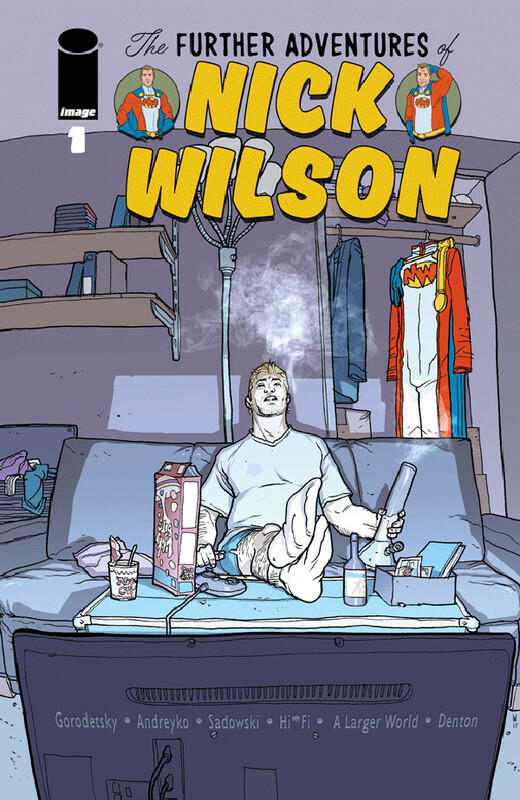 The Further Adventures of Nick Wilson is definitely played for laughs but unlike the vast majority of stories that make light of costumed crime-fighters, its humor hits the target more often than not. This is entirely due to the skillful script-writing and storytelling of Eddie Gorodetsky and Marc Andreyko. Emmy-winner Gorodetsky, a former writer for Saturday Night Live and Batman The Animated Series, and Marc Andreyko (who won an Eisner for his work on Dr. Strange) clearly know comedy and superheroes. What makes this first issue work so well, however, is that the script is almost entirely devoted toward developing Nick as a character and making him into a sympathetic protagonist that the audience wants to root for. We are made to care about Nick because we see that he is a good man dealt a bad hand, rather than a figure of pity. That doesn’t stop us from laughing as he copes with indignity after indignity, of course, but it makes the story much stronger. Steve Sadowski – perhaps best known for his work at DC Comics on Starman and JSA – proves the perfect artistic partner to Gorodetskyand Andreyko’s production. I’ll admit a bias as Starman is my favorite comic series of all time (it’s responsible for my nickname, for those who care), but Sadowski’s streamlined yet detail-driven style suits this story just fine. Sadowski is versatile enough to depict both superheroic and slice-of-life sequences. A word of warning, however. Despite the light tone and cheerful artwork, this is definitely NOT a kid-friendly title. There’s a liberal amount of expletives, adult situations and one embarrassing pixelated picture of Nick Wilson and three ladies in a compromising position. Mature readers with a decidedly immature streak, however, will love the laughs this book delivers and anxiously await Niick’s further adventures. 10/10. The Further Adventures of Nick Wilson comes out January 17, 2018.